Come hang out with Brad Frost for a day to learn about Atomic Design in Dayton, OH. In just a few weeks, Brad Frost will be in Dayton to talk atomic design and whatever else you want to discuss. 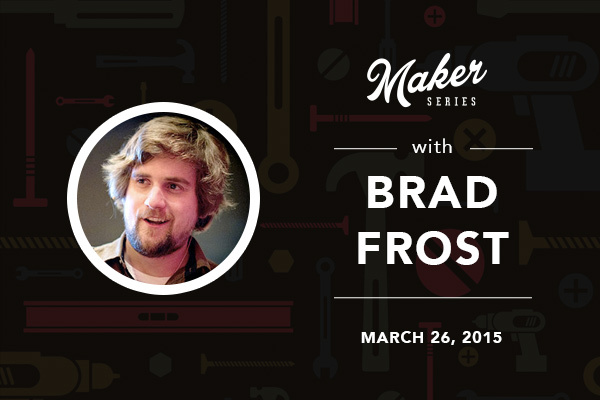 We’re thrilled to have Brad join us for a sweet Maker Series, and we’re sure you’ll love the chance to spend a day with this open, laid-back, and influential dude. Brad has made a big impact on the web industry in only a few years creating This is Responsive and developing a tool for frontend pattern libraries called Pattern Lab. Five other excellent, influential web industry people will also come to Dayton for our 2015 Maker Series. We’re talking great people with great topics like: Tim Kadlec (performance budgets), Pamela Pavliscak (designing with data), in addition to Karen McGrane (content strategy for mobile), Dan Mall (design workflow), and Ethan Marcotte (responsive web design). You can still get a ticket to Brad’s talk and the others this year. Earlybird tickets are still available for most events. And, if you’re feeling like an even better deal, we have a few season passes left, that right now will save you more than $700 off the regular price for all of the talks this year.